One of the major challenges facing society today is the increase in drug use especially the opioid crisis. In addition, mental health issues are increasingly an issue in community and family conflict. 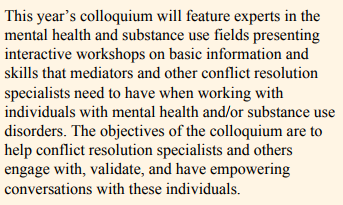 If these issues are of interest and you are in the DC area, consider attending the Colloquium for Conflict Resolution Specialists: A Primer on Mental Health and Substance Use, October 27, 2017 at Montgomery College in Rockville, MD.